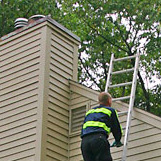 Employing only CSIA trained & certified chimney sweeps, we offer chimney cleanings, chimney repairs, chimney lining services, chimney rebuilding, chimney inspections and much more to homeowners in Windsor CT, Canton CT, Simsbury CT, Farmington CT, and West Hartford CT, along with the surrounding Hartford County area. Local residents have trusted in us to provide chimney sweep services for the last 30 years. Thousands of satisfied customers depend on Northeastern Chimney, Inc. as their go-to chimney sweep since we stand behind the work we complete and ensure that each customer receives the best service possible. We are fully insured to work on your property and our uniformed chimney sweep techs will always arrive on time and in a clearly marked company vehicle. Each technician is trained and certified by the Chimney Safety Institute of America so you can rest assured that your repairs, cleanings, inspections, or maintenance is performed correctly & efficiently. You can’t miss our distinctively marked trucks traveling through Poquonock, Rainbow, Hayden Station, Wilson, and Deerfield, and along Rt 15, Rt 30, Rt 92, Interstate 91, and Connecticut Interstate 291, as we travel on our way to provide a full range of chimney sweep services and chimney repairs & maintenance. You can count on Northeastern Chimney to provide you with timely service, a written estimate, and a full explanation of recommended chimney repairs or maintenance. We have a satisfaction guarantee which means we work hard to ensure that everything gets done quickly and correctly so you can get back to enjoying your fireplace, stove, insert, or other heating appliances. We are a member in good standing of the National Chimney Sweep Guild (NCSG) so we stay on top of the best practices, chimney sweep knowledge, and industry standards. This is just one reason why residents in Windsor CT have made us their favorite local chimney sweep contractor. Don’t fall for the chimney sweep scam! So-called “chimney contractors” may knock on your door or even call on the phone to offer you a chimney cleaning or inspection at a price that is too good to be true. Don’t be fooled - these contractors are not trained or certified, and usually are not even insured, to perform any type of chimney service. Their main goal is get the job by offering unbelievably low prices for common services, then attempt to upsell the homeowner into extremely expensive repairs once they arrive at the job site. They know that most homeowners are unaware of the current condition of their chimney and they use that to their advantage to scare the homeowner into thinking that immediate repairs are needed. Never agree to services you are unsure of if you find yourself face to face with someone you think is trying to scam you. Instead, call a reputable chimney sweep service for a second opinion to find out exactly what needs to be done. Chimney sweeps that offer low, low chimney cleaning prices often result in inferior or incomplete work which can leave your safety in jeopardy. We service fireplaces, stoves, inserts, venting systems, and chimney systems across the greater Hartford Connecticut area. 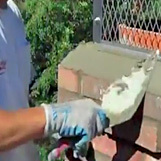 Your safety is our prime concern when it comes to chimney repairs.